For the researcher of the architectural history of Portland, the Historic (.pdf) Resources Inventory of 1976 is an invaluable tool. Although not a complete inventory and somewhat questionable, to modern eyes, in its boundaries of districts, it carries a wealth of information on some of the city’s best known homes. It was the entry for our subject, and the mention of the Venetian Gothic style, that piqued my interest in the building. The attribution of Simon Libby comes from the application to the National Trust for Historic Preservation Historic District application for the Deering (.pdf) Street neighborhood of 1982. The application states that Libby had been active in the neighborhood in the 1850’s although our subject is the only house of the era listed for him. Libby would be heavily involved in development of the Deering Street area during its growth after the Great Fire of 1866. He would build a couple of blocks for himself and built for others including the Thomas Brackett Reed house from 1875-76 which abuts our subject. The Venetian Gothic style of architecture was not commonly seen in New England. It’s origins as a revival style date to the 1840’s & 50’s when the noted English painter and noodler John Ruskin declared it to be the most perfect form of Gothic Architecture due to the ‘sacrifice’ of the stone carvers in creating such rich decorations. Ruskin’s first work, The Seven Lamps of Architecture, of 1849 was a purely theoretical affair that delved into the ‘truth’ as defined by the gothic. His second book was The Stones of Venice, published in series between 1851 and 1855. In this he developed his ideas on how and why the Venetian Gothic was the preferred style. 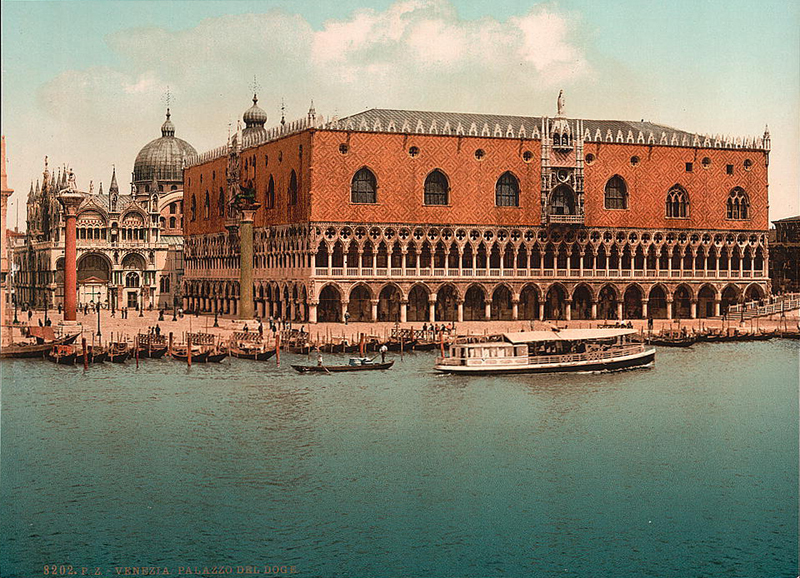 He also states the Doges Palace in Piazza San Marco was the “central building of the world”. Ruskin’s previous writings on art had already introduced him to American artists and thinkers. His works, listed above, introduced him to a whole new group of influential people. It has been said that in the 1850’s he was every bit as popular as Dickens and Sir Walter Scott. Given the dates and popularity of Ruskin’s books along with our subject’s build date, it seems likely that someone, the architect or the builder or the client, had access to a copy of The Stones of Venice. Not surprisingly, the building is Italianate in its massing and primary elements. It’s tripartite arrangement was fairly common for the period as was the twin projecting bays framing an inset central bay. The designer didn’t break any new ground there. It was the details that set the building apart from the others. The view above gives us much of the more outright Venetian Gothic outside of the first floor bays. The capitals of the colonnettes are right out of Ruskin as are the gothic arches above the windows. I have to say that the lack of balancing colonnettes, or any sort of supporting structure, on the outside ends of the arches is quite off-putting. I have yet to find images from The Stones of Venice that are free to use but a plate on page 107 shows quite clearly the capitals on our subject. The tax photo from 1924 further below shows the trim and bays in a lighter color than the current chocolate-brown. It looks like the lighter color would have been much more complimentary to the brick and overall design. Around the time he moved his office, John Munger changed his profession. For the 1870 census he gave his profession as lawyer. Although he seems to kept his place ‘at the bar’ he had by 1873 turned his attention to selling insurance. For the city directory of that year, Beckett listed Munger as a lawyer but not in active practice. He was also listed as selling insurance with his eldest son Charles under the name of J. W. Munger and Son. John and Emeline had 5 children. John who died at the age of 4, Clara, who died before reaching her first birthday, the previously mentioned Charles, born in 1861, Emma, born 1865, and Clara, born 1871. At the time of the 1880 census the family were all living together along with Emeline’s sister Mary. There was also living with them an Eliza Munger, 32 years old and a public school teacher, who may have been related to John but she gave her state of birth as Maine, Olivia Mason, 25 years old and a Maine native, who was also a public school teacher and a 40 domestic servant from Ireland named Elizabeth Bennett. Emeline died of consumption in 1880 and was buried in Evergreen Cemetery. 1880 was also the year John Munger sold our subject to George and Harriet Walker. John remarried in 1883 when he and Roseltha Bowdoin wed. Roseltha was a native of Hollis Maine. Her first husband, Issac Day, died in 1879. John W Munger died in 1894 and was buried by Emeline in Evergreen Cemetery. Roseltha died in 1911 and was buried in Hollis. The attribution to Charles Kirby is circumstantial but, to your’s truly, significant enough to go with. He was from Massachusetts, probably Boston, and was born in 1826. He started as an apprentice with an architect in Worcester in the early 1840’s and formed a short-lived partnership in 1848. By 1850 he was married with a newborn child and was living and practicing his trade in Portland. The city directory of 1850-51 lists him on Cedar Street. Kirby left no other tracks in his time in Portland that I can find . In 1855 he submitted the winning design for the Boston Public Library. He moved to Boston in 1855 or 56 to oversee construction of the library. Later he became greatly involved in development of the Back Bay district. It’s the date of 1855 and the similarities of the library and our subject that drive my current belief that Kirby was the architect for 209 State Street. The building is currently assessed as an 8 unit apartment block.